Chris Bradbeer (ILETC Researcher and A/Principal Stonefields School, Auckland) writes about teacher collaboration in ILEs,. This article appears in this month’s issue of Education Review and shared here with their permission. The idea that teachers will be working collaboratively represents an implicit but commonly underemphasized aspect of the shift into Innovative Learning Environments (ILEs). It’s often a feature by design. Notably many contemporary primary school spaces whether newly built or refurbished, are predicated on the idea that collaboration will be taking place; teachers won’t have their own classes in their own classrooms. Instead, sharing responsibility for teaching a larger cohort of students, in a space containing multiple flexible or purposeful learning settings (Fisher, 2005). 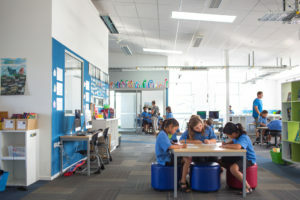 It’s very much the vision of the Ministry of Education’s current property policy (Ministry of Education, 2011) – one that sees spaces built that are future-focussed and, that with appropriate professional learning and quality teaching, may have the potential to enhance opportunities for student-centred pedagogies (Byers, Imms, & Hartnell-Young, 2014). However, such spaces are reliant on teachers working in close proximity, and in doing so, relinquishing some of the autonomy, privacy and ownership that have previously been afforded by more traditional settings (Bradbeer, 2016). So although the shift into new environments may most obviously be emphasised by architectural changes, arguably it is this collaborative aspect that may result in being the most significant and complex professional transformation (Waters, Marzano, & McNulty, 2003) in the shift into Innovative Learning Environments. Educational history documents multiple collaborative initiatives that have enjoyed high degrees of success. Furthermore, extensive research has shown that building professional teacher capital, developing Collective Teacher Efficacy, and focused school-wide collaboration have played significant roles in leveraging school change. Collaboration is generally seen as a good thing. But I wonder to what extent some of what we have described as collaboration in our schools really is? How much of it is actually coordination, organisation, and ‘getting along’ rather than collaboration in it’s truest sense of the word? Of course ‘getting along’ is important and may well ease the whole process, but collegiality and collaboration are not interchangeable. They may well reflect each other but the former is more concerned with qualities of relationships as opposed to the actions we undertake (Kelchtermans, 2006). The critical difference I see in teaching together in ILEs is that it brings the level and intensity of collaboration to the fore. 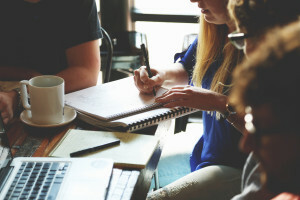 Collaboration is no longer an activity we are able to step out of our own classroom spaces to take part in, and then to step away from afterwards. Hence collaboration can no longer be a visited activity; more representative of a step-change in how we might work with colleagues. It’s a great definition. It shows that collaboration goes beyond levels of coordination and cooperation – in essence through increasing levels of intensification and sophistication – and is noted for its more formally understood relationships and level of commitment (Mattessich & Monsey, 1992). The emphasis is on solving a problem, bringing people together to collectively work and achieve something in a way they are unable to do on their own. Perhaps because they lack the knowledge or expertise to do so. Alternatively maybe due to a lack of resource or experience. Starting with a shared problem provides a great reason to work together in the first place too. Let’s face it, if we could do it on our own then what would be the point of collaborating in the first place? What I particularly savour in Gray’s definition though is the last component; the aim to go beyond our “own limited vision of what’s possible”. Not only is it about solution-finding but it is a language of opportunity, of possibility, and potential. Given that definition, is the regular 90 minute team meeting after school on a Wednesday really an example of effective long-term collaboration? Is priority actually placed on utilising our collective skills, knowledge and expertise to enhance student experiences, opportunities and progress? Are we together able to do something for students that we are not actually able to do on our own? If we take Gray’s definition of collaboration and use it to problematize the work we are doing in the context of teaching in ILEs it presents an interesting wondering. We might ask in this case, “if teaching collaboratively in an ILE is a way to solve a problem, then what is the problem we are trying to solve?” Alternatively, “if teacher collaboration in ILEs is the answer, then what was the question?” What are we able to do together that goes beyond our own vision? How might we constructively explore our differences in the search for solutions? How clear are we on what we are trying to achieve together? I’d argue these are important things to be able to articulate; not only to ourselves, but within our own schools and contexts and across our wider communities as we shift into our shared ILEs. In doing our responses may help us set collaborative direction and to provide clarity and common goals around what it is we are trying to achieve together in our ILEs. Innovative Learning Environments potentially provide us with wonderful spaces in which to explore these questions and solutions – together. I’d suggest that developing more sophisticated understandings of collaboration may help us in turn to maximise the opportunities engendered by the provision of these new spaces. This I think is when they’ll become truly innovative. Bradbeer, C. (2016). Working together in the space-between: Pedagogy, Learning environment and teacher collaboration. In W. Imms, B. Cleveland, & K. Fisher (Eds. ), Evaluating learning environments: Snapshots of emerging issues, methods and knowledge (pp. 75-90). Rotterdam: Sense. Fisher, K. (2005). Linking pedagogy and space: Proposed planning principles. Victoria: Department of Education and Training. Kelchtermans, G. (2006). Teacher collaboration and collegiality as workplace conditions: A review. Zeitschrift für Pädagogik, 52(2), 220-237. Mattessich, P. W., & Monsey, B. R. (1992). Collaboration: What makes it work. A review of research literature on factors influencing successful collaboration. St. Paul, MN: Amherst H. Wilder Foundation. Waters, T., Marzano, R. J., & McNulty, B. (2003). Balanced Leadership: What 30 years of research tells us about the effect of leadership on student achievement: A working paper (pp. 1-19). Aurora, CO: Mid-Continent Regional Educational Lab.